Copies of Restoration of Property normally ship within 3 business days. 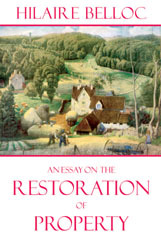 An Essay on the Restoration of Property is Belloc's most famous Distributist tract, being a clear, concise, and straightforward sketch of how a society of real property owners might be re-established and defended. "Re-established," because, contrary to popular opinion and our own personal experience, civilized society up until the last 150 years consisted largely of independent owners of real property. Men, either individually, as heads of families, or in cooperative enterprises, owned  as opposed to renting from a landlord or renting from a bank (what is now called a mortgage)  the means whereby they made their livelihood. Though such a situation is almost incomprehensible today, being as we are so accustomed to working for someone else for a wage in order to support ourselves, it was not so long ago that men possessed real freedom to control their own destiny. It is possible again; Belloc's outline is just one of many possible glimpses of what such a situation might look like. We say "defended" because once established, such a society must be maintained by consensus, by custom, and by law. Modern economic "thought" would maintain that the "invisible hand" of the "free market" automatically guarantees the greatest amount of material and moral happiness for the greatest number in society; such nonsense should be easy enough to dismiss, in light of Enron, WorldCom, and you-name-which other scandal that has recently rocked Wall Street as a result of the "no holds barred" and "anything goes" economic vision. Just as some men in the not too distant past choose to inaugurate and implement the social-Darwinist economic free for all, so too may men today freely decide to move society in a different direction. A society where cooperation, community, and culture are superior to profit, franchise expansion, and silly fantasies like the "New Economy." All it takes is a vision, and a practical sense of how to implement that vision; Belloc's Essay provides both. Don't delay! Get multiple copies at the first-run price!